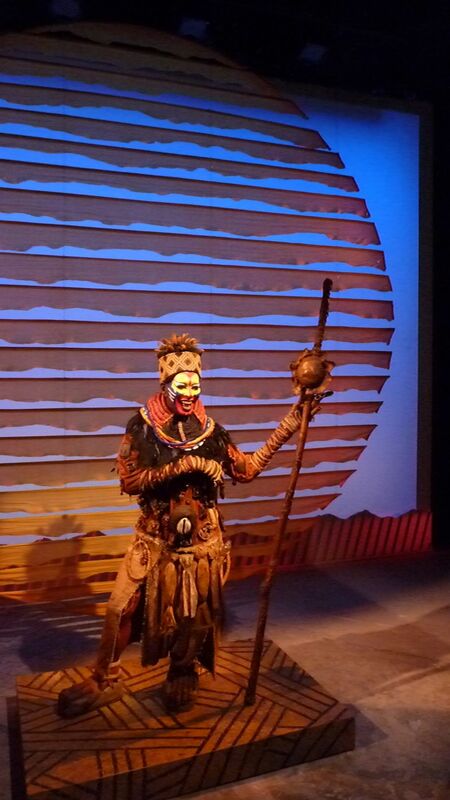 Since opening on Broadway in 1997, Disney’s The Lion King has been by over 65 million people to date. Disney Theatricals celebrated the 15th Anniversary of this ground-breaking musical with a show-stopping holiday gift – Broadway’s first immersive, pop-up exhibit in New York City. 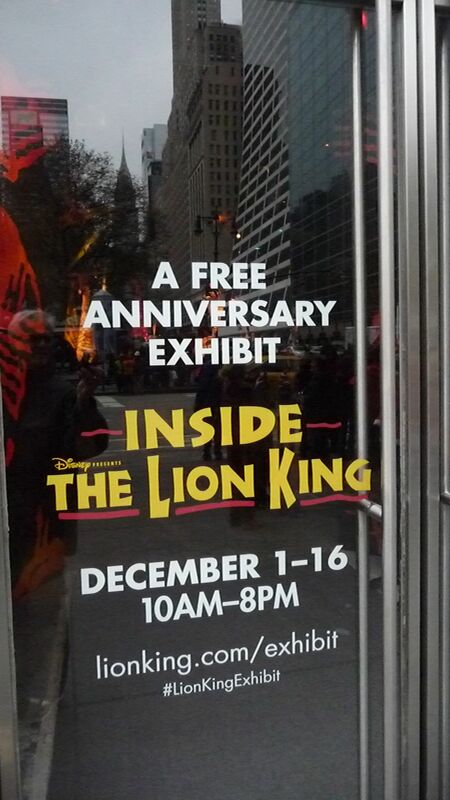 Located at 1095 Avenue of the Americas, adjacent to Bryant Park at 42nd Street and 6th Avenue, Inside The Lion King was a free exhibit open from 10AM to 8PM daily (closed December 16th). 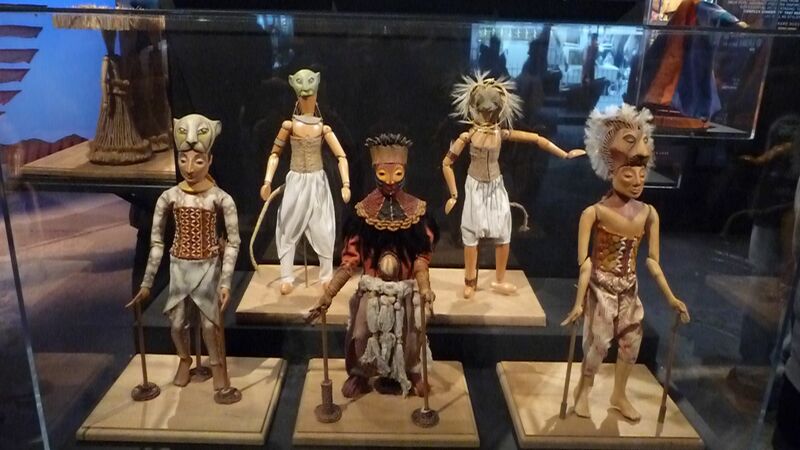 It gave fans the opportunity to get up-close and interact with 86 museum-quality artifacts including hand-made puppets, sculpted masks, elaborate artisan costumes and extraordinary sets that have appeared in productions from around the world. 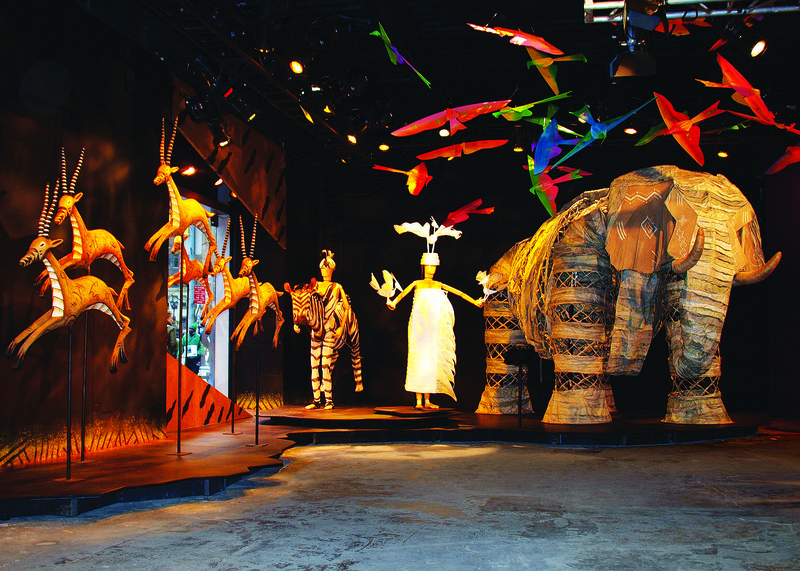 The exhibit was arranged in groupings, and not only took visitors backstage, but also into the entire creative process including concept designs, modeling, set mock-ups and much more. Upon entering the exhibit guests were greeted by the adult Simba costume. This is the first of many photo-ops in the exhibit. Cast members, located throughout the 5,000 square-foot exhibit, answered questions, encouraged guests to take photos, and unlike other exhibits where touching is not allowed, they encouraged visitors to step up on the platforms and touch just about everything. Moving clockwise around the exhibit the first large display was the Lioness and the cheetahs. Next up was the Savannah with the leaping antelopes, zebras and Bertha the elephant. Getting up close to Bertha allowed guests to see how it takes four actors to make this mammoth 13-foot elephant come to life. Next to the Savannah was the wildebeest stampede exhibit. 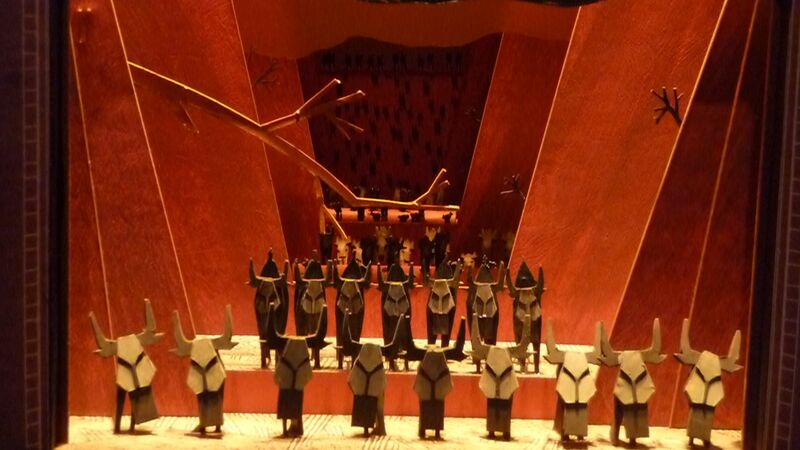 Guests could walk among the masks and see how forced perspective was used to create this amazing show scene. 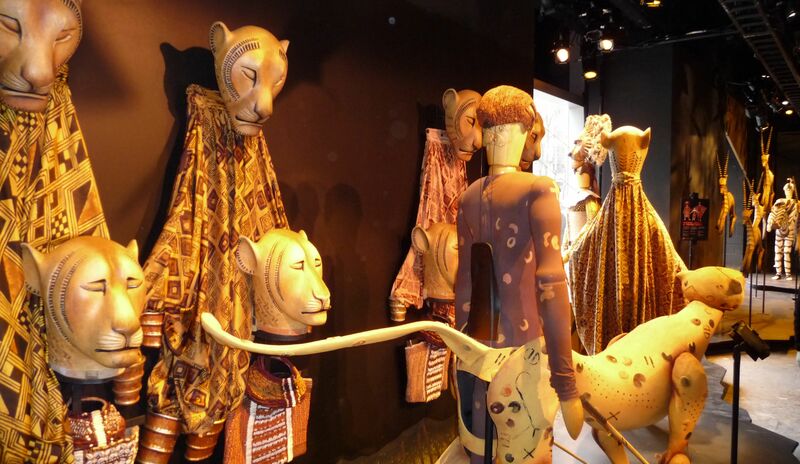 Even though The Lion King has a number of images and characters that are considered iconic, the next exhibit was dedicated to the voice and first image guests see in the musical – Rafiki and the rising sun. The wax figure, on loan from Madame Tussauds, was one of the most popular photo ops in the exhibit. Next was a large display honoring the creative team. The display also had insights from the various members of the creative team sharing what they were hoping to accomplish in the musical. Also on display was one of the six Tony® Awards that the musical won. Next came the fantastic giraffes, graceful and towering 17-foot ostriches and Zazu. Zazu is the majordomo to Mufasa and, later, Simba. In the musical, Zazu is controlled by an actor dressed in a blue striped suit and bowler hat, much like a stereotypical butler. The final large display was that of Scar and the hyenas masks. The life-size figure of Scar is the second wax figure courtesy of Madame Tussauds. In addition to the large displays there were numerous smaller displays on the walls and towards the center of the room. 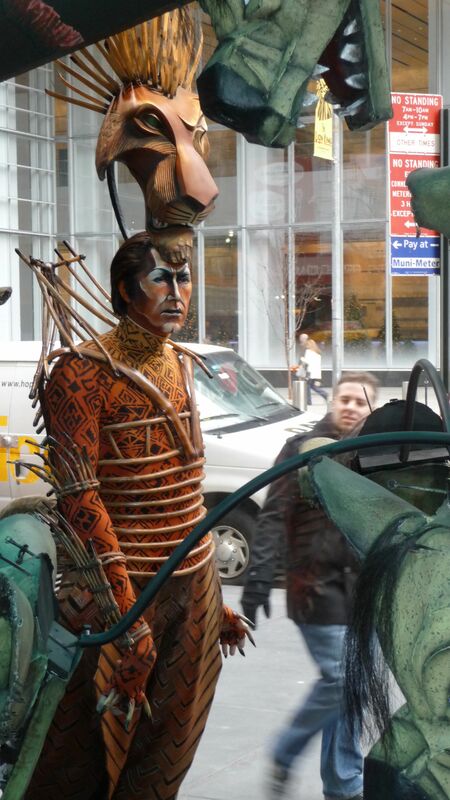 These included beautiful black and white and color costume and set design sketches – many by Tony® Award Winner Julie Taymor. In display cases guests could see miniature models with various costumes, set scenes and sections of the bone yard that spirals up from the stage almost out of nowhere. In a series of special weekend workshops, Disney teaching artists were on-site to share an insider’s look into the music, dance, design and story that form one the most successful musicals in Broadway history. December 15th, 10:30 AM – 12:00 PM & 3:00 PM – 4:30 PM - Movement - Feel the rhythm of the Pridelands and learn choreography from the show. 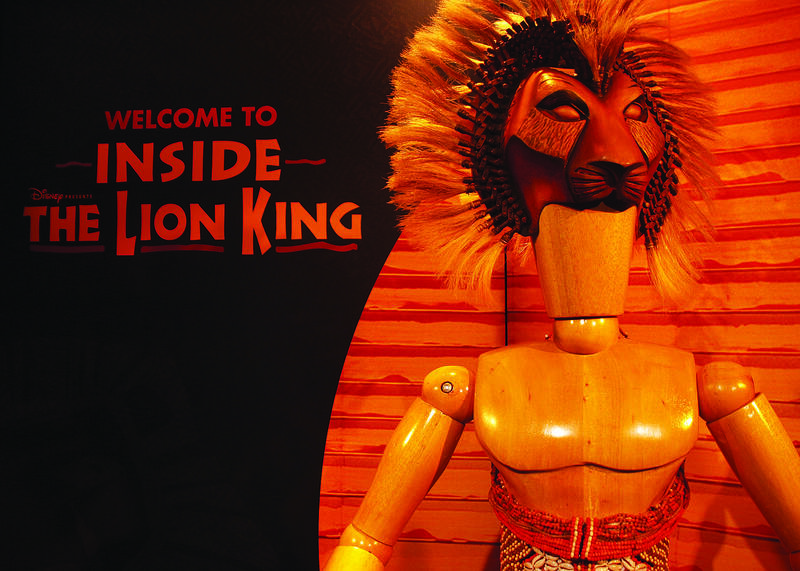 December 16th, 10:30 AM – 12:00 PM & 3:00 PM – 4:30 PM - Design - Explore the artistry of The Lion King and create an original mask. These workshops can be enjoyed by adults and children over the age of 6. All children must be accompanied by a guardian. 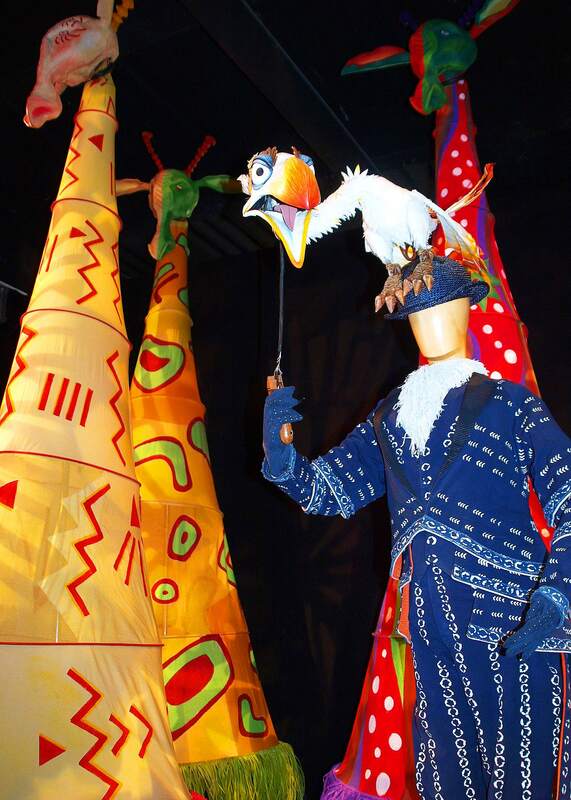 There was also an extensive selection of memorabilia and show souvenirs – including special edition exhibition merchandise and tickets to the Broadway productions of The Lion King, Newsies and Mary Poppins available for purchase at the exhibit. For more information, visit lionking.com/exhibit. 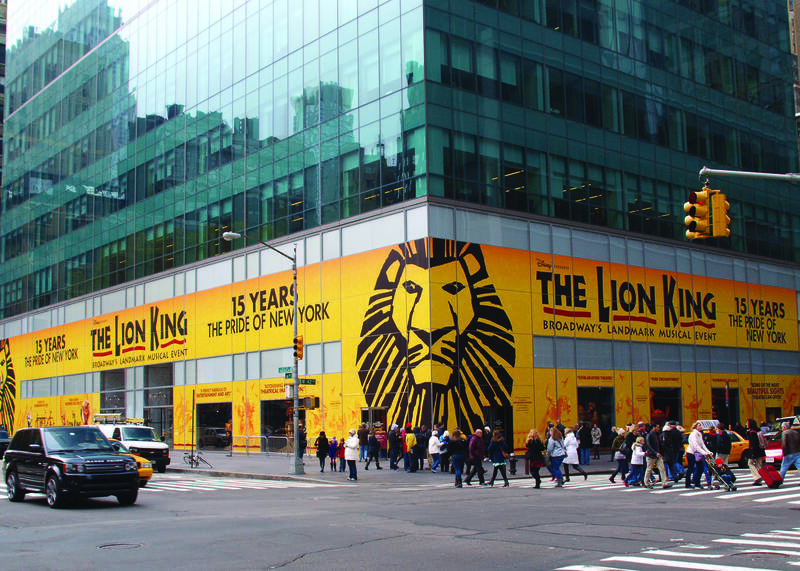 ‘Inside The Lion King’ was supported in part by partners including; WABC-TV, WPLJ, New York Magazine, Madame Tussauds and Xerox. As it enters its 16th year, THE LION KING remains ascendant, recently becoming the highest-grossing Broadway show in history. Since its Broadway premiere on November 13, 1997, 20 productions around the globe have been seen by more than 66 million people, grossed over $5 billion and, cumulatively, run a staggering 96 years. Produced by Disney Theatrical Productions (under the direction of Thomas Schumacher), THE LION KING is the fifth longest-running musical in Broadway history and only the second show in history to generate five productions running 10 or more years. Translated into eight different languages (Japanese, German, Korean, French, Dutch, Mandarin, Spanish, Portuguese), the show has been performed in 15 different countries on five continents. 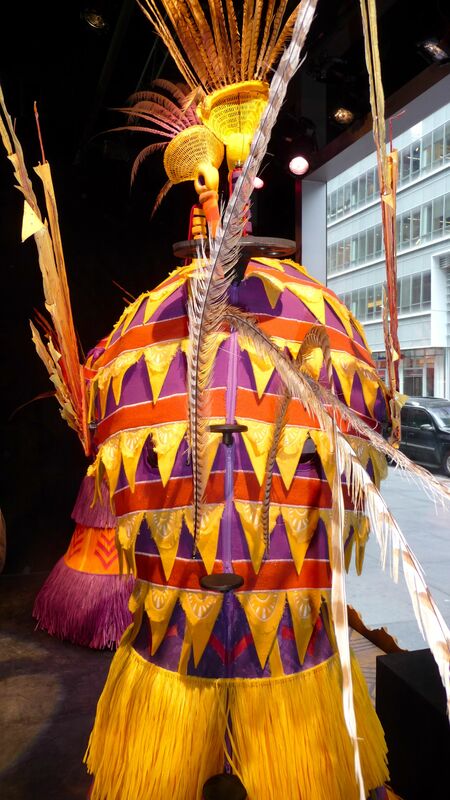 Continuing to reign as one of the most popular stage musicals in the world, THE LION KING can currently be seen on Broadway and on tour in North America, in London’s West End and on tour in the UK, in Hamburg, Madrid, Tokyo and on tour in Japan. THE LION KING won six 1998 Tony Awards®: Best Musical, Best Scenic Design (Richard Hudson), Best Costume Design (Julie Taymor), Best Lighting Design (Donald Holder), Best Choreography (Garth Fagan) and Best Direction of a Musical, making Taymor the first woman in theatrical history bestowed with the honor. 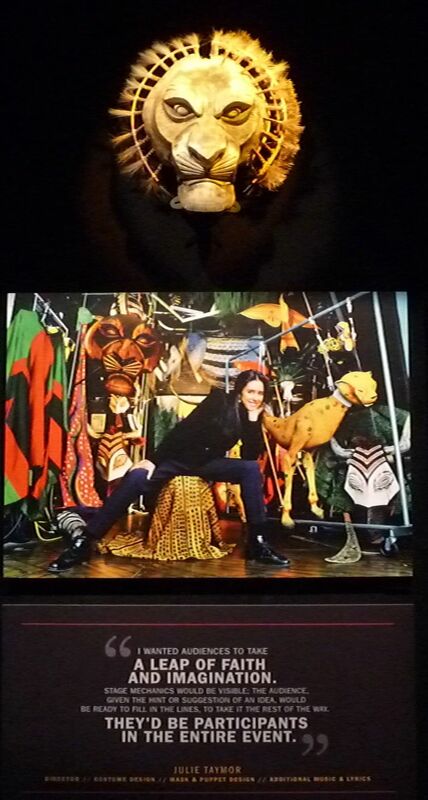 THE LION KING has also earned more than 70 major arts awards including the 1998 NY Drama Critics Circle Award for Best Musical, the 1999 Grammy® for Best Musical Show Album, the 1999 Evening Standard Award for Theatrical Event of the Year, the 1999 Laurence Olivier Awards for Best Choreography and Best Costume Design and seven 2012 Spanish Musical Theatre Awards, including Best Musical. 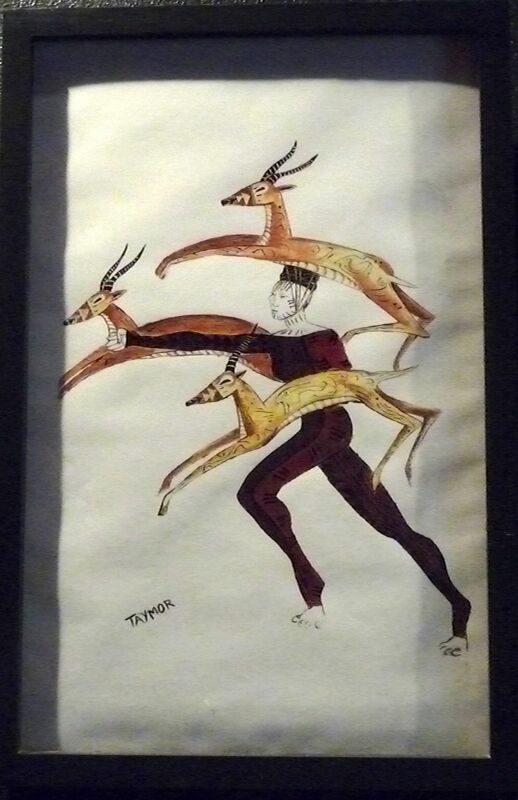 On stage, Taymor’s creative vision blends elements of African art and Broadway artisanship to depict anthropomorphic animal characters. 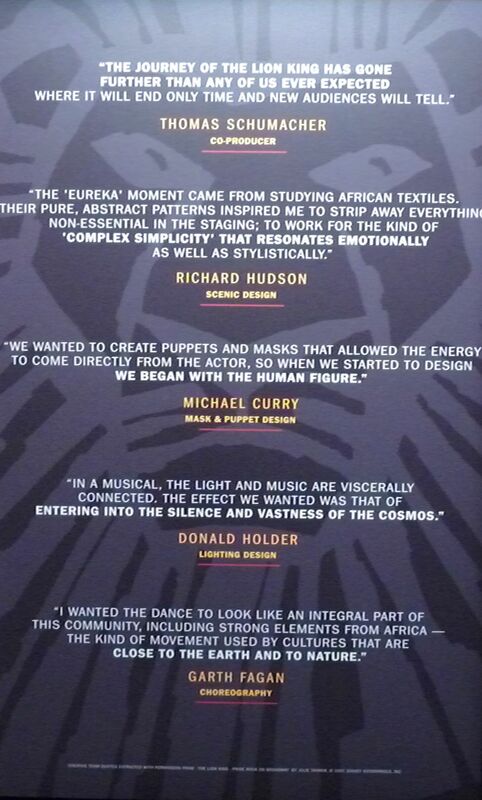 Taymor, along with designer Michael Curry, has created hundreds of masks and puppets for THE LION KING. The book has been adapted by Roger Allers, who co-directed The Lion King animated feature, and Irene Mecchi, who co-wrote the film’s screenplay. Other members of the creative team include: Steve Canyon Kennedy (sound design), Michael Ward (hair and makeup design), John Stefaniuk (associate director), Marey Griffith (associate choreographer), Clement Ishmael (music supervisor) and Doc Zorthian (Production Supervisor). Anne Quart serves as associate producer. 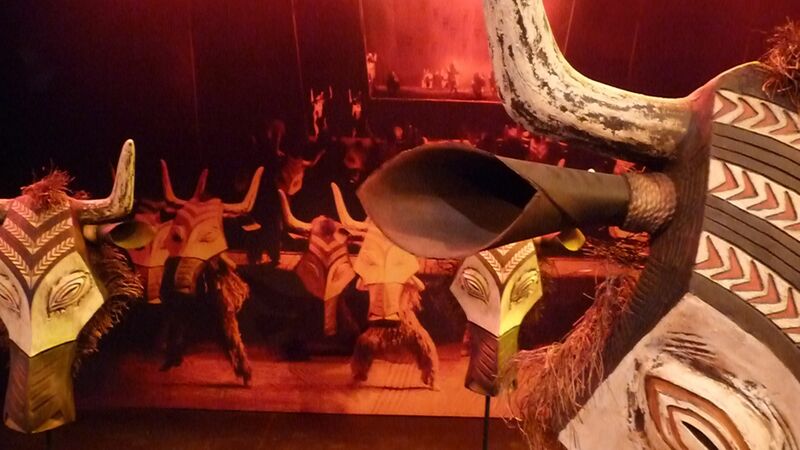 The Lion King Roars into Town: A Worthy Disney Park Fix?